Reviewed by Colin Marshall. Viewed on Air New Zealand flight NZ5. Moon‘s advance press raises one’s hopes, but then, this is a day when hopes for science-fiction cinema are easily raised. Rumors of high aesthetics, deep psychological resonance and CGI eschewed for elaborate miniatures make the it sound like the formidable yet implausible love child of 2001, Solaris and Silent Running, and in fact Jones hired one of the latter film’s effects men. Such a pedigree admittedly prompts impossible expectations, but with the genre’s recent standard of substance set by the likes of J.J. Abrams’ entertaining but unexaminable Star Trek reboiling, we take hope wherever we can find it. Much of the movie’s buzz regards it as a twist delivery system, as if M. Night Shyamalan had finally made his inexorable way into outer space. Since Jones all but lays out his cards quite early in the film’s brief runtime, these attempts at plot-point concealment seem unwarranted. At the tail end of a three-year stint maintaining a mining site on the moon and jonesing to return home, Lone astronaut Sam Bell wipes out in his lunar rover. He wakes up in the infirmary of the space station Sarang, his home for the length of the job. But since he’s supposedly the only human on the entire rock, how did he get back there? Did someone drag him all the way? But who? The film raises a suite of eerie questions. It answers them quickly: Sam did. Or at least he will. Out of bed, he sneaks over the the crash site, out of which he pulls a body, only to discover that it appears to be his own — and it’s alive. It seems both Sams hold equal claim to the name, though the rescuing Sam has less in his short-term memory than the rescued. Accepting the situation with a strange degree of equanimity, the twins go about trying to determine what’s going on. Hence the second volley of questions: Is one of them the “real” Sam Bell? Are there more? Is the original Sam Bell perhaps elsewhere? Is he even alive? The explanatory mechanism here turns out, alas, to be an Evil Corporation, or at least an amoral one that’s discovered how much labor can be extracted from an indefinitely long series of clones if you tell them elaborate enough lies. Sam One and Sam Two make a stab at putting one over on their employer by having one of them actually return to Earth rather than file themselves away in Sarang’s below-ground morgue, but personality differences roughen the road. Yes, they’re technically the same person, but it’s all about nature and nurture, I suppose. Portraying both main Sam Bells, one more the station brings aboveground and presumably the voice of another still, heard over a moon-to-Earth videophone, Sam Rockwell, the living midpoint between leading man and character actor, puts on essentially a one-man show. (The only other major character is a placid robot assistant, like HAL but more benevolent, voiced by Kevin Spacey.) His Sam One is a skittish, obsessive shambles on the brink of disintegration — these clones only need three-year life spans, after all — while he plays Sam Two as more of a cockily hostile Tom Cruise type. He creates two clearly different individuals who are also, it seems, the same individual. As an actor’s showcase as well as a proof of the concept that a modern futuristic movie can look even more compelling without the aid of CGI, Moon is impeccable. (As space films go, it’s the best-looking in years.) But establishing Sam Bell’s experience — or, rather, the Sam Bells’ experience — on film requires the utmost steadiness of hand, and here the hand falters. The histories of both science-fiction and psychological cinema insist that this sort of situation simply can’t come across in 97 minutes, and they’re correct. That Jones paces several stretches of the picture expertly, especially those before Sam Two’s appearance, underscores the uncomfortable jerk of the inevitable instances of compression. The movie does a fine job of acting as if it’s always well-paced, but ultimately it simply doesn’t have enough time to make the audience’s experience anything like Sam’s, to make us feel what he feels, to conjure the environment of Sarang beyond its sights and sounds. All narrative films are, in some sense, visual summaries of an experience, but when Moon rushes, as it does through its abrupt ending, it’s as if it’s providing us with the Cliffs Notes when it knows full well we want the text. The Moon is a very thoughtful science fiction movie. Unlike other movies that have similar background, Moon predicts human’s future in a different way. And as I see it, is a very deep and thoughtful way. It starts with an ordinary man who’s working on the moon. Everything seems in a perfect order and he’s going to return to the earth and enjoying the reunion of his families. However once an accident makes him gradually realize that actually he is a clone man. And suddenly all his memory about the people, the events and even the earth that he thought he familiar becomes very doubtable. Naturally the movie leads people to think about not only the problems of the clone technology but the entire human future. As you said, classic science fiction is a dying breed, and I found this film offered a poignant and eerie affirmation of the value of a live model set (especially given the context of our latest revolution in CGI). I also agree that the story’s ambitious three-year span deprives us of the details we so appreciate, but I fear the people who would watch a five-hour film on the nuances of a lunar existence are, sadly, another dying breed… And so I’d like to laud Jones for achieving a balance of conceptual density and emotion that gives Moon what I would describe as a deep sense of human empathy in just 97 minutes. I should disclose that I viewed Moon in an empty theater in Northern California so the whole desolation-of-the-human-condition theme was particularly affecting… Interesting fact: the moon is moving away from the earth 1 ½ inches every year. Thank god for a good Sci-Fi! I feel indebted to Duncan Jones for bringing Moon to fruition. I have been a long time lover of classic sci-fi like 2001: A Space Odyssey and The Day the Earth Stood Still. So seeing this film was hugely gratifying. The art design on this film was particularly notable for me, the way they turned what we expect to be clean modern outer space into essentially a worn down trailer. Little details like the “Kick Me” sign on Gurty or Sam’s radio alarm clock. I agree that the film was a bit short, but I felt like it gained a nice momentum at the end. What stuck with me the most from this film however was the final lines of the film after he’s made his great escape, American pundits respond with “ either he’s crazy or an illegal immigrant; either way he belongs in jail”. Oh the accuracy and the irony. Reading this review stretched my mind. Unlike the author, I did feel the viewer had enough time to experience what Sam experienced. The silence of the film distorted time enough to make me feel like I was sitting through another “Lord of the Rings” epic. Perhaps the silence of the audience did this as well. I disagree that the film looked good. Although the sets were very clean, I thought they were flat and boring, especially the outdoor lunar sequences. Maybe that’s how the moon is though. I felt there was a huge potential for long, sweeping panoramic shots with ultra-bright celestial bodies in the distance. That would have given the impression of being increasingly more isolated on the dead moon, such as in Stanley Kubrick’s “2001: A Space Odyssey.” Maybe they weren’t going for the same grandiose feel, but I still feel “Moon” could have benefitted from it. 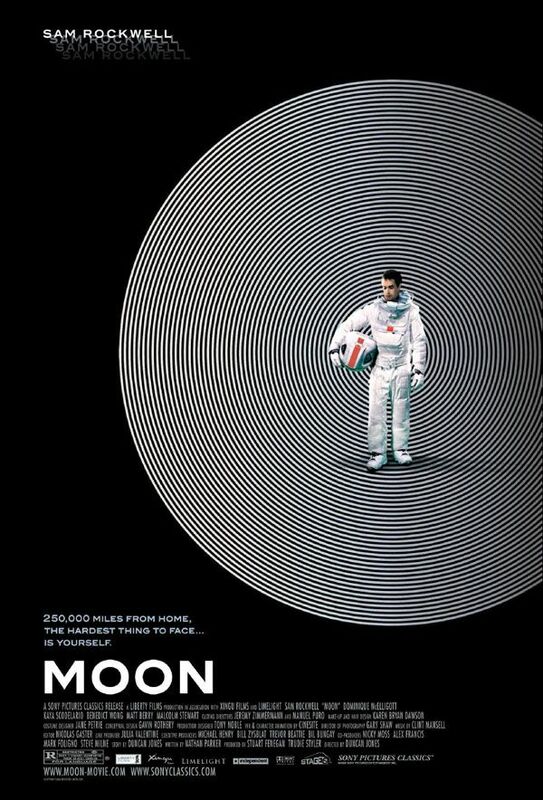 Speaking of “2001,” I thought this film borrowed many aspects from it, such as the music and the lunar sets. There is a part in “2001” where the main character travels into a depressed area on the surface, only to find the famous obelisk. There are many areas like that in “Moon” that Sam travels too. I suppose I wouldn’t have noticed this as much if I wasn’t thinking of “2001’s” soundtrack the entire length of the film. The similarities in music are especially evident when Sam dips down into the belly of the space station to find more clones. On the plus side, watching this film made me feel like I was playing with “2001’s” little brother. Sam Rockwell is an actor I like, as he is very versatile in the personalities he can chameleonize into. Kevin Spacey has a hypnotic voice as the creepy computer. The plot is very engaging and cerebral. The film is also incredibly emotional towards the end when you watch Sam call his daughter on the video-phone. To be stuck in the same loop that Sam is stuck in seems too painful to imagine. Moon was an amazing low-budget film in my opinion. I had to wait weeks to see the film from its original release date, on top of that I had to drive three towns away to see it. Even with all that work it paid off. I felt the trailer that I drooled over for weeks gave to much away before seeing the film. But it did make me want to see the film. So, I don’t know if that a bad thing. Well Moon appealed to me on many levels. First I love space films, and I really enjoy Sam Rockwell, on top of that Kevin Spacey’s voice is in it. The story again was ruined by the trailer but still pulled me in. I really enjoyed see Sam Rockwell play the same character twice, with two different personalities. His performance was very compelling and sometimes very frustrating. Many times in the film you would know something that the character did not know. This really bothered me, because I just wanted to shout at the screen. This is not to be taken as a horrible thing, it really pulled me into the film. Overall watching the same character twice in the end really wasn’t that bad. The story was very interesting and had many questions of morality and a nice commentary on our current energy problem. All these little touches really made the film a conversation center piece for me. The visuals were not up to par with big budget space film, but they still looked very real and I feel do not detract from the film. The visuals only help to reinforce the setting. All in all I would recommend anyone watching the film for the first time, not to watch the trailer because it will give a lot of way. I recommend this film to anyone that wants to see something new and unique. I really think that philosophy and psychology majors would have a nice analysis of the character, and even environmental studies majors will enjoy this film. Moon was a fascinating and amazing film from start to finish. Although, this film obviously did not have a large budget, it still was visually captivating. Sam Rockwell gives a great acting performance; an excellent on man show, and although Kevin Spacey does not appear on screen, his role as GERTY was extraordinary. I loved the whole plot of the film, it really makes you think how different the world can be in the future. More over, the film raises ethical issues, such as cloning, and what is considered human life. The entire film was just breathtaking, I could not keep my eyes off the screen. Excellent Movie!